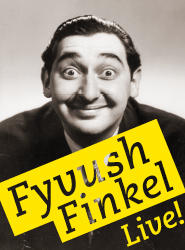 Starting today and running through November 7, the Folksbiene Theater will be presenting Fyvush Finkel Live!, a show highlighting the 88-year-old Finkel's incredible career spanning English and Yiddish roles from Second Avenue to modern-day television stardom. The show is a musical celebration of a life on stage, starring Finkel and his sons Ian Finkel and Elliot Finkel. Filled with songs, stories, jokes and ample evidence of Finkel's undiminished mastery of showbusiness razzle dazzle, " Fyvush Finkel Live!" brings us this close to one of the last living links to the Yiddish theatre's rich heyday on Second Avenue. But it also introduces us to one of a very select group of actors who are active and successful in both the Yiddish and mainstream worlds. Very few indeed have straddled the traditions of Second Avenue and mainstream entertainment as convincingly as Finkel, "the face that launched a thousand shticks." All performances will be at the Baruch Performing Arts Center, 55 Lexington Avenue in New York City. For tickets, which are $55, call (646) 312-5073 or visit www.folksbiene.org. Born in Brooklyn, Finkel began his career in the Yiddish theatre as a teenager. After a long stint touring in "Fiddler on the Roof," he starred in the Off-Broadway hit Little Shop of Horrors for five years, earned an OBIE in Café Crown (which moved to Broadway), and teamed up with his sons Ian and Elliot, and grandson Abbot in two musical revues -- Finkel's Follies and From Second Avenue to Broadway. A beloved television star, Finkel earned an Emmy Award in 1994 for Picket Fences and he starred in the acclaimed series Boston Public, which ran from 2000 to 2004. His most recent appearance was in the opening sequence of the Coen brothers' film A Serious Man, in a Yiddish-language dramatization of an erzatz folk tale about a tzaddik who may or may not be a dybbuk. Here's a trailer for the show at the Folksbiene, followed by a video clip of Finkel singing a Yiddish classic, I am a Boarder by my Wife. Enjoy! I wish i could figure out how to share this one. I would like to share the latest blog I wrote for my Yiddish translation website: "Rivka's Yiddish." The blog pertains to Yiddish theater and makes reference to the recently deceased, Fybush Finkel, who got his acting start in Yiddish theater. should you have any translation and/or research related queries. "God Only Knows What I'd Be Without Jews"